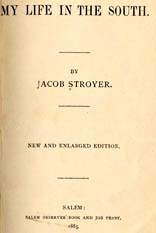 Jacob Stroyer, 1849-1908 My Life in the South. Salem: Salem Observer Book and Job Print, 1885. African Americans -- South Carolina -- Biography. Rare Book, Manuscript, and Special Collections Library, Duke University Libraries, provided the text for the electronic publication of this title.